The period covered by Arts:Search is 1887. Available now. Subtitled A Monthly Journal of Authoritative Criticisms on Works of Art for Artists and all Art Professions. Scarce short-lived magazine – only 12 issues were published (July 1887-June 1888). Contained brief articles on the art market; biographies of artists; art news; reports on art sales; and exhibition and book reviews. 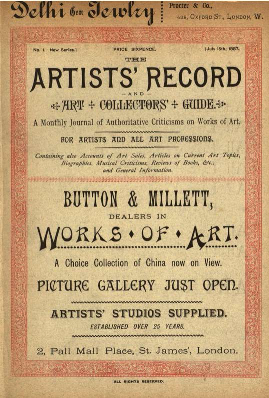 So far only one issue (vol.1, no.1, July 1887) has been digitized by Arts: Search. This issue contained articles on Queen Victoria’s Jubilee and the fine arts; Indian Art; George Du Maurier; Messrs. Dowdeswell’s new galleries; the new rooms in the National Gallery; and critical notes on the Royal Academy Further issues will be digitized if they can be traced.